Now that training is over I thought I would carry out a little review of the last two and a half months. I was always a bit concerned that we were not doing enough as the general consensus seems to be that paddling three times a week for three months prior to the race is the minimum training required and we left it a little late getting started. That said, we were all used to paddling 10km at least once a week in the preeceeding months as well as various other activities. 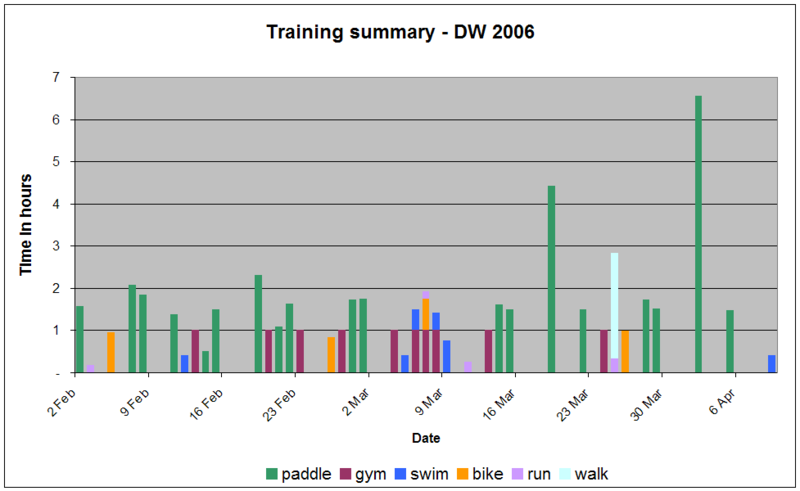 The table and graph below give a summary of what I have done since the beginning of February. One interesting statistic that emerged is that I have paddled a total of 313km in that time. The race itself is, of course, 200km!